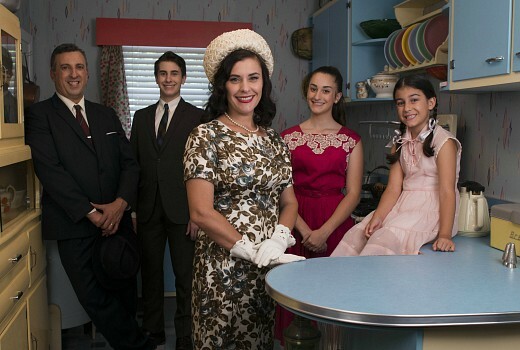 ABC’s Back in Time for Dinner has won its slot with 614,000 edging out Shark Tank on 571,000 and Interview on 559,000. Nine may have been in the game earlier but its MH370 special failed to draw enough viewers. MasterChef Australia again won its slot at 881,000 over House Rules on 729,000 and Young Sheldon up to 645,000. It’s worth noting that Who Do You Think You Are? hit a season high of 425,000, proving to be an endurable brand for SBS. Love Island hit a low of 136,000 for 9GO! failing to make the multichannel top 20. Seven network won Tuesday with 30.4% then Nine 24.3%, TEN 21.1%, ABC 16.4% and SBS 7.8%. Seven News (1.05m / 1.01m) was #1 for Seven then House Rules (729,000), Home and Away (700,000), The Chase (623,000 / 398,000), and Interview (559,000). Nine News (1.02m / 1.02m) was best for Nine then A Current Affair (883,000), Young Sheldon (645,000 / 619,000), Hot Seat (597,000 / 392,000) and MH370: Inside the Situation Room (370,000). Serial Killers with Piers Morgan drew just 249,000. MasterChef Australia (881,000) won its slot for TEN then The Project (586,000 / 370,000), Shark Tank (571,000), TEN Eyewitness News (436,000) and Family Feud (349,000). NCIS: LA drew 255,000. ABC News (705,000), Back in Time for Dinner (614,000), 7:30 (511,000), Making Child Prodigies (440,000), Think Tank (264,000), and Secrets of Silicon Valley (217,000) comprised ABC’s night. On SBS it was Who Do You Think You Are? (425,000), Insight (192,000), SBS World News (139,000) and Dateline (117,000). Outback Truckers on 7mate topped multichannels with 240,000. David, Love Island is huge on everything except television! I just saw that it’s numbers on VPN and 9Now are bigger than MAFS and the Love Island YouTube clips are now into the millions of views. I think it’s fair to say that it will be watched by a lot of people – just not on TV! Except that for the cost it needs to work on TV too. It’s not Yummy Mummies budget. But I am looking at an article for context. I don’t report VPM in daily wraps and not about to start. I agree about Gordon. Last night he was so good the way he mentored and helped those 3 contestants. He had more enthusiasm than shannon has. Even the way he was joking around with the professionals. 3/The young chef continually adding more and more flavour..we all knew that would lose it for him. 4/That meat dish by the pro..he was taking that challenge as seriously as a in grown toe nail. Does anyone know why TEN trims Entertainment Tonight to just 14 minutes when it’s a 30 minute show? Today’s episode aired 2.12pm-2.29pm and included a 3 minute commercial break. Odd. It’s been trimmed to fit the available time due to the overrun of Masterchef repeat eps-it’s also notable that the early morning repeat of ET has been dropped due to double eps of an American soap-also worth noting how randomly the 9 equivalent Extra is shown-both networks are full of much repeated stuff but wont show something new! I didn’t think I would but.. I’m really enjoying Gordon Ramsey on MasterChef, he’s bringing such an infectious energy to the show and it’s giving me the feels. The way he’s been mentoring and helping the contestants is like nothing I’ve ever seen with any of the other guest chefs..
Really wanted to watch Back in Time for Dinner but totally forgot it was on, will have to watch on catch up. Seems like it did good numbers though so hopefully it’ll be sticking around. I used to love tripe until I found out what it was….ughhhhhh ! MC and Ramsey have been superbly entertaining this week. Love Island is enjoyable daily trash, Tayla is my favourite character. Is she a character or a real person? I think she is a real person, but you never know with these types of shows. Did anyone else enjoy the ‘spin the bottle’ confessional challenge? Not as good as it could’ve been. Just plain old spin the bottle would’ve been better instead of the cop out questions meaning some of them just kissed their partner anyway. I really enjoyed Back In Time. The family they have chosen is really wonderful, very polite and smart kids. I had one quibble, regarding the dad eating dinner alone because that’s what dads did back then??? I thought that was a bit of a stretch. My dad and all my friends dads always were home in time for dinner with the whole family. Agree. A few goofs. It wasn’t the done thing at all to have dad eat dinner alone, no matter what time he got home. Also, the beef wrapped by the butcher magically became minced beef when unwrapped in the kitchen. It would have been hand-minced by the mother, or one of the children, using her mincer. And most families I knew all sat down together…usually 6PM….but I did enjoy the show. MC…Mr Ramsey has been really supportive and encouraging…good to watch. Back In Time For Dinner was well done but I take issue with a few things. For example, tripe stew was a common meal because it was inexpensive. Well we were a working class family and as a child in the early fifties we never ever had tripe nor did anybody I ever knew. Irish stew was most common. Father eating alone and mother having dinner earlier with the kids never happened in our family. We always dined together. Apart from those few things the program fairly accurately reflected my memories of life in the early fifties. Looking forward to next weeks episode. No way was I going to watch Back in Time For Dinner, but I did and it was pretty good. They should have got a TV in 1956 and used public transport instead if riding a bike and the husband would have, at least, dried the dishes. Apart from that ..
No one “got a TV in 1956”. Masses would throng to retailers’ shop windows every night to watch TV. Similarly, very few used public transport to get to work. Walking or bike were the form of transport. And….nooooo….no self-respecting husband would be seen drying the dishes. 74 y/o just able to relate to that. The family didn’t get one in 1956. It was referenced as social history in narration. In Perth in the late 60s when I was a young kid, ‘rush hour’ was still mostly bikes and buses-and our house’s first TV was a coin operated hire one! The Interview with Magda was the best interview so far in my opinion, so candid and honest, funny and sad. Agreed, it was a wonderful and insightful interview. Andrew Denton just has a way with making his guests feel comfortable and for making an interview flow. Not a huge fan of Andrew Denton, so I hadn’t intended on watching Interview with Magda but I ended up seeing the whole show. Mind you, as soon as they mentioned the giggling I reckon I could watch an hour of just clips of Magda giggling inappropriately in out-takes. Would be a ratings hit for sure!! Back in time for Dinner is the best show I’ve seen on FTA this year. Loved it. I think a lot of Shark Tank’s jump last week was due to the promos, Steve swearing/storming off set. Love Island is looking like an expensive flop. I don’t think anyone expected Love Island to rate high in total viewers. It was created with the younger demographics in mind and to drive traffic to 9Now, which it has been doing. Of course it was expected to do better. Nine / GO are very disappointed. Even the younger demos haven’t been flooding into the series…..
That’s not true. It’s been overwhelmingly young skewing. It’s just more younger viewers preferred “Avengers” on 7mate on Sunday and Outback Truckers/Highway Patrol on 7mate last night. “Back In Time For Dinner” was quite entertaining, although I wonder if it was a truly accurate reflection of life in the 1950s, anyway good casting of the family by the production people. Not surprised “Love Island” is a ratings flop, this should kill off Sophie Monk’s TV career. Back in time for dinner was interesting and thoroughly enjoyable. Will be back next week to watch the family live through the 60s.